ZTechnik® wants to enhance every mile you spend on your R1200GS/GSA by making your equipment work easier with enhanced functionality. To that end, ZTechnik developed the LeverAction™ Rake Adjust Kit, a slick, injection-molded lever that replaces the chunky rake adjustment knobs on the R1200GS/GSA. 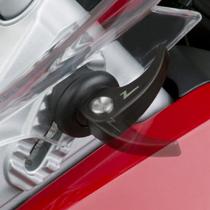 * R1200GS models that have converted to R1200GS Adventure windscreens and mounts must use Z5202 instead of Z5300. ZTechnik adds a new twist to a familiar design. The Windshield Experts™ introduce LeverAction™, a trick replacement kit that obsoletes the knob-and-nut hardware on the BMW® R1200GS windscreen. ZTechnik® wants to enhance every mile you spend on your R1200GS/GSA by making your equipment works easier with enhanced functionality. 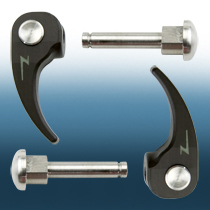 To that end, ZTechnik developed the LeverAction Rake Adjust Kit, a slick looking, injection-molded lever that replaces the chunky rake adjustment knobs on the R1200GS/GSA. The LeverAction™ Rake Adjust Kit combines the shaft and nut of the traditional windscreen adjustment hardware into a one-piece design, eliminating the possibility of nuts getting loose and falling into your motorcycle. A quick flip of the lever is all it takes to disengage the windscreen – within seconds you will have your screen in its new position and be back on the road! LeverAction works great with both BMW® and ZTechnik windscreens (except Z2243) and is made of nylon plastic and stainless steel for long lasting durability and high-tech good looks.